Traveling to New Zealand with baby/toddler/kids in tow? Here are some tips to help! One of New Zealand's excellent playgrounds for kids. We found one in literally every place we visited. New Zealand is an incredibly child/family-friendly destination. 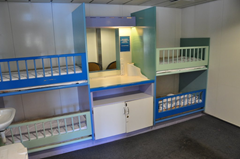 We found changing facilities almost everywhere, frequently along with designated spaces for nursing! Wendy felt very comfortable nursing in public although she did use a nursing cover (just as she would have at home in California, or anywhere else). 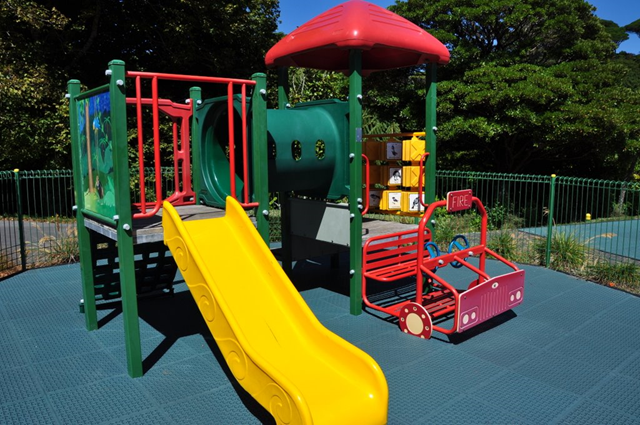 There are lots of playgrounds in New Zealand and they always seemed to be in good repair. We found one in every town we were in – no matter how small. We did lots of wine tasting during our trip. We were surprised (and delighted) to find many of them not only welcomed children – they had a collection of toys available for them to play with! Our daughter (10-months-old at the time) was warmly welcomed literally everywhere we went, including museums, art galleries, restaurants and hotels. Diapers are called nappies. Strollers are called prams or push chairs (just like they are in the UK), but people usually seemed to understand what we meant anyhow. Watties and Only baby food were available everywhere we went in New Zealand. Both brands offered organic choices. There are grocery stores everywhere in New Zealand. We had no trouble finding a place to buy food along the route. 4 Square, Fresh Choice and New World are common chains. 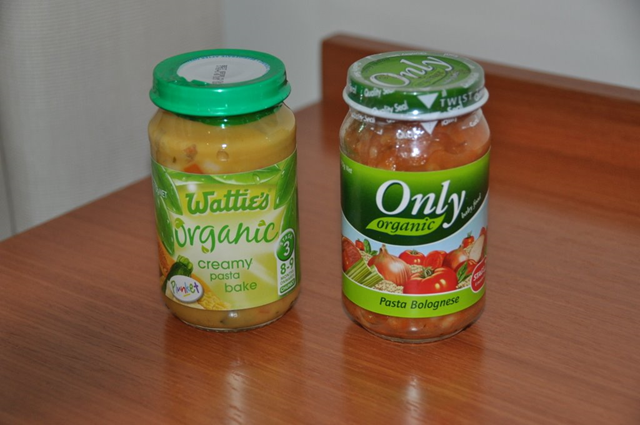 We found “Only” and “Watties” baby food everywhere. Both brands offer organic food and our daughter seemed to enjoy them both equally. (“Only” is actually the brand served on Air New Zealand). Every grocery store (and there were many) we shopped at also stocked diapers and baby wipes, however we never saw teething biscuits, puffs or other snacks aimed at babies. These were also widely available, although, much to our surprise, Pampers are not. We used the Huggies ones (available in boys and girls!) and had no problems. If you come from the US, it helps to know that there are 2.2 lbs to the kilo in order to figure out which size to buy for your child. Diapers were also available in the airport (just in case). The Warehouse – a cross between Target/Walmart/Carrefour and Costco – seemed to be the cheapest place to get diapers. They sell them in huge boxes, so would be a good place to stock up at the beginning of your trip. Again, these are pretty common, so it should be easy to find one. YHAs (youth hostels) were very welcoming. They don’t have cribs, so if you’re traveling with a toddler/baby you’ll want to make sure to bring along your Phil & Ted’s Traveler (Travel Cot). Although the rooms tend to be on the small side, we had no trouble getting ours to fit and felt welcome. Hostels are a great way to save money – so they’re perfect for family travel! Other hotels were equally welcoming. Some did have cribs available, but it was still nicer to have our own. Playing in the excellent kids' area on the ferry between the north and south islands. We rented/hired our car from Avis. They provided us with a car seat which they installed for us (thankfully!). The only hiccup was that we had to take it with us on the ferry. This actually wasn’t a big deal. Their representative helped us to remove it from the car and it was checked through for us without a problem, so we didn’t have to carry it on board. The amazing nursery on the ferry from the north to the south island. Along with the cribs and changing area there was an easy chair for nursing and a sink and bottle warming area. On the ferry from the North Island to the South Island there was a designated nursery. The room was complete with bunk cribs (with fresh linens), change table, microwave for warming bottles, and a rocking chair for nursing! We have never seen such an amazing set-up! There was also a children’s play area including a space for climbing/crawling, a giant chalkboard that they actually cleaned and made ready for use, and a huge TV showing cartoons with a kids’ seating area. Been to New Zealand with baby/toddler/children? Please share your tips and experiences! We’re planning a 2 week trip to New Zealand with a very active 16 month old and I found your tips useful and reassuring. Which places were you able to travel to in NZ with your child in tow? Were you able to do many physical/ adventure activities with your child around? Any tips would be very welcome!